My name is Esmeralda Lopez, and I am 53 years old. When I was told I had kidney failure, I felt my world turn upside down. I felt that my days were numbered and didn't know how it got to this point. What had I done to have this happen to me? I prayed that I would get better, that I would live long enough to see my daughter get married and have kids. I started HD in May 2012. When I went to the center, I saw all the people hooked up to the machines and I thought to myself that I didn't want to live like that, to have to spend half my day every other day in a room with people doing the exact same thing. There would be times where I would cry to my husband about how I felt. That was when my husband, Irving, started researching peritoneal dialysis (PD) and told me we should do it. So we signed up for a class that would give us all the information we needed. I started PD in August 2012 at Satellite WellBound of Austin and my husband has been by my side for everything, taking me to the classes and getting to know everything there is to know. I am so happy I did this. It doesn't interfere in my daily life; I just "plug in" at night, and the machine does all the work while I sleep. I wake up more refreshed and have more energy than I did before. I can spend all day with my family and friends and not have to worry that my time with them is limited. Stories like these inspired Satellite WellBound's Regional Director of Operations, Patrice Zyry, to spread the word of Home Dialysis to physicians whose unfamiliarity may bar them from prescribing it to patients. In August, she partnered with HHD equipment provider, NxStage, to host two workshops answering questions and providing instructions to interested physicians. 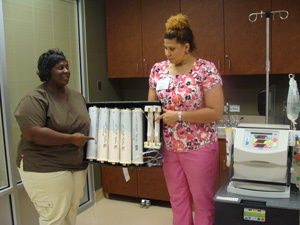 The workshops, which were two hours long, took place at Satellite Dialysis – Poplar, in Memphis, Tennessee. "There are several important barriers to more widespread use of HHD," commented Dr. Elvira Gosmanova, a referring nephrologist who helped create the program. "But unfamiliarity should never be one of them." Due to the positive feedback received from the physicians who attended, they plan to put on future programs. Home dialysis, as demonstrated by Esmeralda, is a great way to allow patients the ability to live a normal life, not dictated by trips to a dialysis clinic. Home therapies nurse Joy Barringer, who attended the event, said she noted during an opening presentation, that Satellite had three times the national average of individuals on HHD, "It makes me proud to work with an organization that is so focused on helping kidney patients retain and regain their independence."